Paramount doesn't want you to forget that Teenage Mutant Ninja Turtles is coming out in just a few short weeks, so they have released another new TV spot. And this one has a pretty funny stinger at the end, depending on your tolerance for juvenile humor. 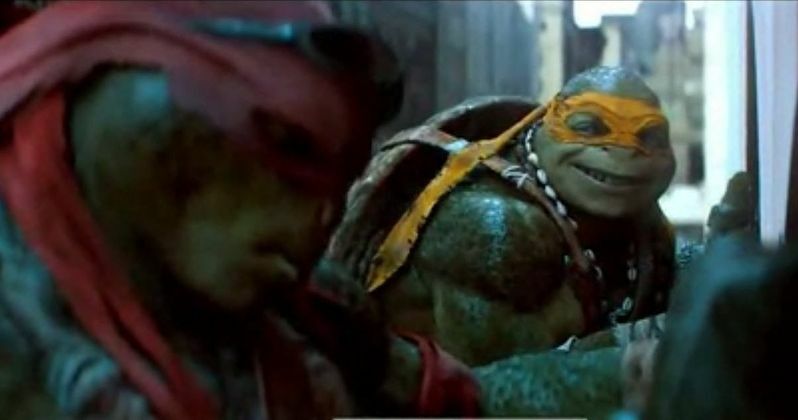 Showing off the pure essence of producer Michael Bay and his influence, the scene in question finds Raph and Mikey making great use of a New York City billboard. If you laugh, this movie's probably for you. If you frown at this, then don't bother with a ticket. The city needs heroes... Darkness has settled over New York City as Shredder and his evil Foot Clan have an iron grip on everything from the police to the politicians. The future is grim until four unlikely outcast brothers rise from the sewers and discover their destiny as Teenage Mutant Ninja Turtles. The Turtles must work with fearless reporter April and her wisecracking cameraman Vern Fenwick to save the city and unravel Shredder's diabolical plan.